I did a little testing on Instagram the other day about this Paleo Coconut Curry Meatball Soup. Thanks for all the love on my little IG feed everyone & Guess what? Diane Sanfilippo also gave a thumbs up to these meatballs! Another reason I’m sharing this post with you today is that this Sunday – besides super bowl Sunday – is also Chinese New Year’s Eve ! Any food that’s a round shape – like these meatballs, Tang Yuan (a Chinese sweet dessert), and Chinese dim sum buns – is considered lucky, and hence is a great food for Chinese New Year. So when you gobble up these yummy and umami asian meatballs you are also bringing good luck to yourself and the whole family. I’d like to write more recipes for the Whole30 folks. Any thoughts on this? Have you tried Whole30 before or know anyone was in the program ? Tag me on Instagram, find me on Facebook, or tweet me on Twitter. If you love curry and meatballs, you'll love this Paleo coconut curry meatball soup. Enjoy Paleo Thai food and Thai curry in one delicious bowl. Pulse a few times until finely chopped. Mix ground meat with Step 2 ingredients and the rest of meatball seasonings - fish sauce, salt, cumin powder, and black pepper. 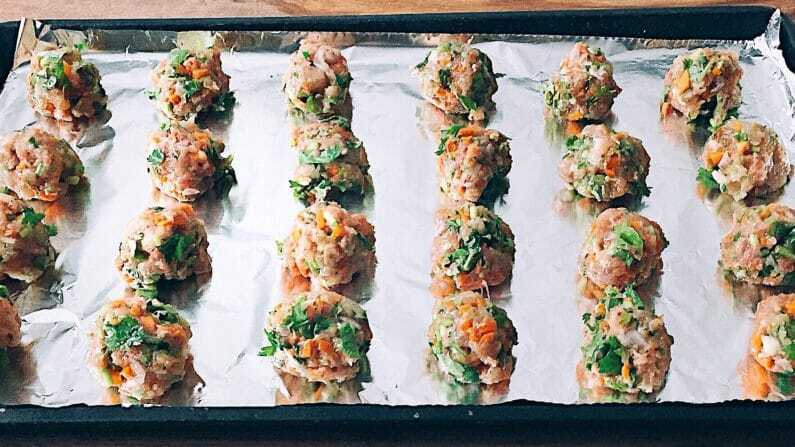 Use your hands to form small round shape meatballs (about 23-24 meatballs). Heat 1 tbsp coconut oil over a medium-large size soup pot (or a wok) over medium-high heat. When hot, add 3 tbsp red curry paste and stir-fry for a few seconds. Pour in coconut milk and bring it to a boil, then reduce the heat to medium and cook, stirring occasionally until the red oil rises to the surface. Add meatballs (one-by-one) and cook for about 10 minutes until they are done. Season the broth with 1 tbsp fish sauce, ½ lime juice. Taste and see if more lime juice is needed. Turn off the heat and add cilantro leaves. Serve hot & enjoy !